When I heard Apple plans to remove the podcasting functionally from iOS 6, I decided to see what other apps might feel the void. What I didn’t understand at the time was that Apple wasn’t far from releasing a standalone app called, well, Podcasts. It’s not a terrible app and it’s free. 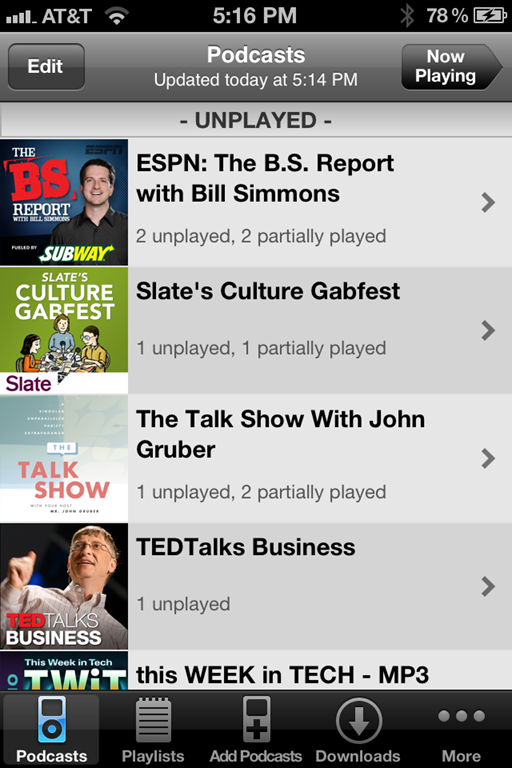 If you occasionally listen to podcasts it won’t get in the way. But it’s not great, and if you listen to a lot of podcasts (or a few religiously) you want a great app that’s responsive, makes searching and adding new podcasts a cinch, and automatically downloads new episodes in the background. So my suggestion is to pony up the two bucks and grab the nifty Downcast that does all that and more. The best compliment I can give Downcast is that it’s earned a spot on my iPhone’s home screen. I wonder if moving it out on its own helps keep the iTunes cleaner and then enables developers to really shine in that area.